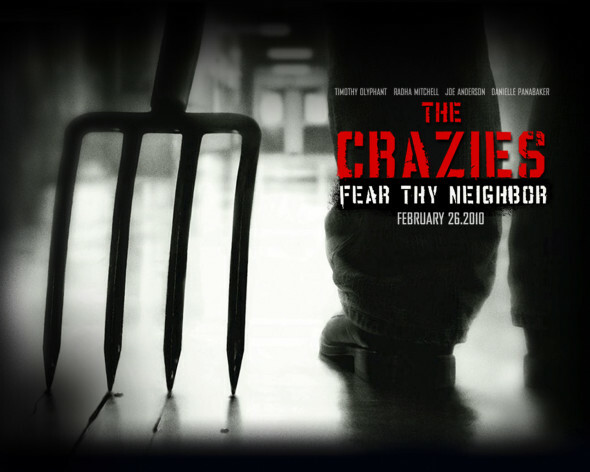 Breck Eisner’s The Crazies, retooled from George Romero’s little-seen 1973 gem, offers solid scares, inventive plotting, and far better performances than expected in a genre film. Building a cumulative sense of entrapment and dread, the film relies on a storyline whisper-close to the overplayed zombie tale, but deviates in a powerful way. The slight alteration plumbs for a different kind of terror, and Eisner’s sense of timing provides a fine balance between fear of the unknown and horror of the inevitable. The Crazies sometimes plays like a more languid 28 Days Later (a film that clearly found inspiration in Romero’s The Crazies). All three films begin by articulating humankind’s repulsion and fear of infection before introducing the greater threat – our own government. Eisner’s film never accomplishes the heights Boyle achieved in each area, but his slower pace builds dread and flirts more often with an effectively disturbing sense of compassion. Eisner’s greatest strength is his cast. The eternally under-appreciated Timothy Olyphant and Radha Mitchell, unerringly realistic as husband and wife, carry most of the grisly weight, aided by solid support work from folks who are not afraid to be full-on nuts. They may not scare you silly, but they’ll keep you surprised and a little grossed out, which ain’t too bad, considering. Eisner pulls Romero’s most notorious punch, but he also knows how to examine individual insanity. Eisner is less interested in government conspiracy and irony and more interested in bloodthirsty lunacy, which is why his film is more fun to watch. It’ll make you rethink the car wash, I’ll tell you what.